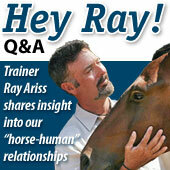 Horsetrader.com News » Q&A Hey Ray! HEY RAY: My recently purchased, beautiful, 7-year-old Palomino Fox Trotter brings a lot to the table — except for a few shortcomings. The biggest surprise was finding out that when I’m on the trail, he comes unglued when bicycles race past him, causing him to become explosive and unpredictable. If I can’t make this behavior go away, he may have to go away. What should I do? HEY JON: There is no perfect horse, and it’s always going to be something! The question to ask here is. “Will I be safe with this horse while trying to figure out how to make it better?” If the answer is no, get professional help and have the horse evaluated. On the other hand, if safety is not an issue, I have an exercise that should help and be fun, too. HEY RAY: Tucker is a 7-year-old Quarter Horse gelding. I’ve spent many years since childhood on the back of a horse, and I am still stumped on a barn-sour/herd-bound horse. I’ve worked through most of the issues on Tucker, but he’s gotten attached at the hip to his barnmate, Dono. Tucker goes from a quiet, sensible easy-goer into an 8-second rodeo bronco. I’m now in my mid-70’s and need this lousy behavior of his to disappear. HEY RAY: I have a half-Arabian, half-Andalusian named Taz. We are moving up in levels and need to change lead every three strides on the diagonal. However, when I ask her to change to the left lead, she tosses her head. She doesn’t do this when I ask for the flying change on a circle – just on the diagonal. And we are in a collected canter. What can I do? Show season is rapidly approaching! HEY SAMANTHA: It’s nice to hear that your mare can do the changes. I’m assuming they are mechanically correct and clean aside from the head toss. On another note, the last thing you want to do is put a time constraint on your training because of the show season. You have worked too long and too hard to get where you are. Unless you get lucky and everything goes your way, you will be setting yourself to fail, especially with flying changes. Consider taking all pressure off you and your horse while you try to figure out where the weak link lies in your changes. A good way to achieve this is to show one whole level below where you train. My horse breaks left in the arena – always! HEY RAY: My 9-year-old mare has an arena problem. She is outstanding and fairly “bullet proof” on the trail, but when I lope her in the arena in right-hand turns, she does well for a while and then suddenly ducks to the left – then goes for the fence. I think she gets bored. HEY TOM: On the surface, this seems like a simple question to answer. Just fight the turn with the right rein and a left spur, then hold the horse between your legs and reins and drive her forward, right? I’m not trying to be funny — I am assuming that you have tried this, and many other things, too. By the way, doing what I just suggested as an obvious answer may work, or it could create a mess if the horse was aggressive or calculating. As you may have possibly experienced already, your mare could very easily rear, leap forward or flip over if you were to get in the way of that tidal wave of energy that she may be throwing your way. What’s ‘Western dressage’ all about? HEY RAY: I’ve read articles and seen shows on Western Dressage. I’m not sure what to make of it. My wife has a dressage horse, and I have a western trail horse – to me, they are on opposite ends of the spectrum. HEY ALLEN: The disciplines of English/ Dressage and Western have been on opposite sides of each other for years – not just on how they do things, but how they feel about each other. One thing we should never lose sight of regardless of the discipline or breed is that a horse is a horse, is a horse. HEY RAY: I gave my friend a pair of clippers for Christmas. He was happy to get them until he tried to clip his horse and the horse freaked out. Now he wants me to clip his horse for him. Do you have any pointers before I get started? HEY SON: This is a great question as well as a great opportunity because most people assume that if a horse doesn’t clip, it’s because they’re afraid of the clippers. In reality, he may be afraid of everything, including the clippers, so you must first figure out where your beginning is. Time bomb or bomb-proof? How do I tell? HEY RAY: I’m looking to buy a horse and I’m really concerned about ending up with a ticking time bomb when what I need is a bomb-proof horse. Do you have any tips for me or red flags to look out for, since I can’t afford to take a professional with me? HEY KAREN: I hate to tell you, but if you hope to end up with the right horse, you can’t afford not to take a professional with you. If you are looking to save a few bucks, you can do most of the running around until you narrow down the list to the two or three favorite horses that should be looked at by your trainer of choice. Believe me when I say, the best money you will ever invest in your horse will be the evaluation given by your professional. Part of that evaluation should include you riding one of the trainer’s lesson horses so that he may get a clear picture of the type and level of rider he will be buying for. The horse that you should see first with your trainer should be the one at the top of the list, and work down from there. That way you might get lucky and end up with your favorite horse and only pay for one pre-purchase evaluation. HEY RAY: How do I know if I am accepting a less-than-desired response from my horse while lunging or riding? Sometimes, I think that I cannot expect a timely or complete response from my horse if he is not warmed up. On the other hand, I realize that I may be training a slow or incomplete response to my aids. Am I on the right track if I get a focused response, but not a strenuous response, during the first minutes of training? HEY RAY: While riding in an arena, another rider came in with a horse that had past difficulties standing still for mounting. She was being assisted by a groom, and despite precautions the horse put her on the ground and went free. Her horse began to panic and run around the arena. My horse held his ground despite being charged by the loose horse. I flexed his neck strongly when he started to react to the excitement. The other horse was caught and no one was hurt. This made me wonder two things: How best to handle that situation if my new stallion got loose? Is there a safe way to prepare my horse for facing a charging, loose horse? HEY RAY: I never had problems bridling my horse, then one day I was in a hurry and rushed taking off the bridle. I ended up with the bridle in my hand while my horse was rearing up with the bit clanking on his teeth. Now it’s almost impossible to get the bit in or out of his mouth without him getting tense. What should I do? HEY LANCE: What happened to you has happened to virtually every horse owner at least once, including me. When I was 10, I had a horse that lacked a good foundation. I had no experience, height or length of arm. I remember trying to stretch up while on my toes, hoping to keep the bit in his mouth while trying to hook an ear into the bridle. I’m sure you know what I’m talking about. This challenge is not just trying to get the bit in his mouth; it has more to do with focus, trust, timing, feel and basic fundamentals about giving to pressure while being scared.